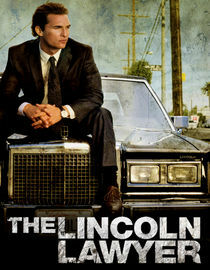 The Lincoln Lawyer, a film about the seedy underbelly of the criminal justice system stars exceedingly handsome Matthew McConaughey as slick LA criminal defense attorney Mick Haller who works out of his Lincoln Town Car...get it? Mick gets caught up in a shady case involving a wealthy client that puts him, his family and friends in danger and he has to find a way to get disentangled while seeing justice done. It's a decent crime thriller with a bumping soundtrack. DH and I watched this a few months ago and really enjoyed it! Wouldn't mind reading the books too. I don't even need to watch the movie. I can just sit here on your blog and look at the pic you posted of the "exceedingly handsome Matthew McConaughey" and still be totally content....Well, not "totally" content, but pretty darn happy. LOL He is a FOXXXXXXXXX! So is this old Mathew McConaughey, when he was subtly handsome and charming or the new slimy, but perfectly pimped Mathew McConaughey? Sorry if I sound cynical, but I was so into him back before he was considered a major hearth throb. Haven't seen that movie yet but will put it on my list. thanks for the recommendation...we are always looking forward to a good movie! i am loving netflix in general. at the moment we are watching a canadian telefilm which makes us laugh :).